Working my way through a crowded train carriage back to London where there’s about thirty grown men singing and dancing around like an absolute bunch of twits couldn’t even put me off what has ultimately been a very worthwhile, very fun & very enlightening day. Even when I knew that standing up and moving to another carriage was going to bring unwanted attention, it did, morons, I ignored them as I desperately wanted to escape their idiotic behaviour just so I could get my hands on my iPad to draft this post! 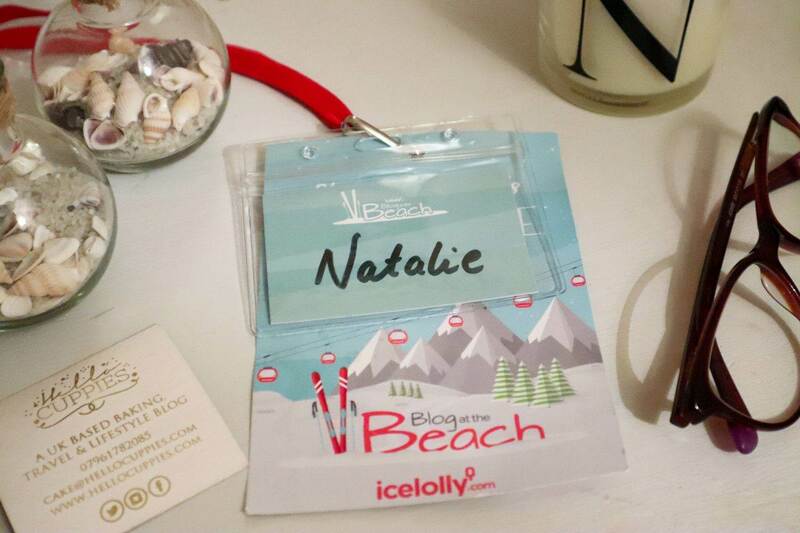 You see, I did have a fab day at the #BlogAtTheBeach event hosted by IceLolly.com. When I have the kind of day like today I leave with all sorts of ideas, positive thoughts and a general bursting kind of energy where I just need to write everything down as quickly as I possibly can. Who has ever been so nervous before a networking event that you almost put yourself off from going? Or, who has been so nervous that night before you can’t sleep…even with an early night! Hands up? It can’t be just me? I mean, come on, all I had to do was turn up…on my own…talk to strangers…and network. It’s not that bad right? No biggie. Even if some of those people in that room were pretty big in the blogging world and some I knew I’d be a bit star struck by, I still knew I’d be OK regardless. Do you know how I knew that? The biggest reason is because there’s nothing quite like being around 85 other bloggers and social media addicts that just ‘get it’. There’s no having to explain what you do, why you do it, or even how it works. These people are my kind of people. The kind of people that don’t bat an eyelid when you whip your phone out to snap your food, your drink, your name badge… anything that looks remotely instagram worthy basically. I promised myself that this year I would step outside of my comfort zone and I’d go out and meet other fantastic bloggers. I’d told myself that I’d turn this nervousness into something positive and I reminded myself that I’m a people person and making friends is usually not an issue. I’m friendly. Tweeting on the train whilst making my way up to Leeds using the #BlogAtTheBeach hashtag was a bit of a clever move. Others responded and it helped me relax a little and somehow the closer I got to Leeds, the more confident I felt. It’s ok to be a little nervous, it just means you’re excited. You do what you’ve gotta do! Taking the the early train up to Leeds was easy and having three hours to kill on a train is actually pretty welcome and a good time to sit and relax. The venue was only a ten minute walk away from the station so I hopped off the train and headed over to Duke St Studios. Being from York I’m quite familiar with Leeds so headed off in the right direction and…got lost! I spotted another girl who I was pretty sure was also lost, had the look of a blogger (god knows exactly what that is) so I asked her if she was going to the same place as me…she was! I was right…meet Jess from Alright Blondie. She was lovely and we sort of hung out together throughout the day. Both were achieved within 30 minutes of arrving! By this point I knew I could do this. So, rather than run through every detail of the itinerary, you can read that here instead, I thought I’d write this blog post around what I learnt. I think it’s quite clear I’m feeling positive and I think the main reason for that is down to the three very clever creative inspiring ladies presenting. All very relatable in their own extremely likeable ways, there’s Kirsty Leanne who has recently given up her job to blog full time and for me has the most inspiring writing skills. Whenever I read Kirsty’s blog posts I thoroughly enjoy them and instantly want to be wherever she is writing about. It’s quite clear from her advice and lifestyle posts she is one business savvy blogger too. Next up was Bee from Queen Beady who works full time alongside blogging and spoke about taking your blog to the next level and how she has achieved everything she has. Bee’s Instagram feed is to die for and her relaxed quirky approach is addictable. And last, but certainly not least, was the bubbly tattooed effortlessly cool Kaye from The Life and Styles of KLF who shared her tips, tricks and handy hints about all things photography. I loved each presentation as equally as the other and I realised that whilst they all were all completely different in style, delivery and experience there was one big thing they all did have in common; individuality. All were also totally relatable, oozed professionalism, were realistic and best of all their advice is achievable. I’ve just started pitching directly to brands, well if you can count two so far that is! One didn’t reply and the other said yes! I wasn’t quite sure if I was doing it right, if there was anything I was missing and both Kirsty and Bee touched on this subject. Bonus! Recently buying a new camera and venturing into using manual mode I wasn’t quite sure on a few things. Kaye covered a lot of this and whilst I eagerly listened to her words (and jokes) I tinkered away with the switches and buttons having a few “now that makes sense” moments. I snapped away but I listened and soaked it all up. Realised numbers aren’t the be all and end all but engagement (current buzz word) is key. Finding your niche and creating your own voice is what really will help you succeed in this competitive world. Pitching to brands, when to do it, how to do it, scheduling, being yourself, learning about white balance – which I found the setting for on my camera today for the first time! One thing I’ve struggled with when it comes to blogging is my niche. I bake and I travel and whilst these two actually fit together very well I’m aware I need to make them gel more. I think I had a little idea whilst I was there and I feel very excited! In all honesty I think I’d already thought of it but I needed today to help me muster the exact idea together. I don’t think I’ve ever been to such a positive, uplifting, motivating event. I didn’t leave feeling disheartened (as I’ve done before with other events) nor confused. Instead I feel excited, proud of what I’ve achieved so far and more motivated than I ever have been! Thank you again to Kirsty, Bee and Kaye. And thank you to IceLolly.com for bringing us all together and hosting such a wonderful thing. Big hats off to Kirsty, master events organiser at IceLolly.com too. What a task she had! I also realised that it doesn’t matter if another blogger is more experienced than you, at the same level or that someone else is completely new, you’re all in it for the same reason. Don’t be competitive, be sharing. If you’ve ever struggled with feeling nervous about networking then do I what I did. Set some simple achievable goals. Pull your big girl (or boy) socks up, and remember that these things can really only benefit you and send you on a more positive exciting blogging journey. Oh, and last but not least, I vlogged too. Or I attempted to! If you read my first post of 2018 I’m trying to learn how to do this and the only way I’m going to get better is with practice. So here’s a little vlog of the day too. Hand’s are slightly less shaky this time. I think I’m meant to say this, so I’ll take the opportunity now – SUBSCRIBE TO MY CHANNEL! Ha-ha. Pushy I know… 😉 Oh yeah… you can watch my #BlogAtTheBeach VLOG RIGHT HERE. "Top 12 Tips For Going To Coachella From The UK"
I love this post! I think its a normal feeling for anyone heading into a networking event because you just don’t know what to expect from it, nonetheless i’m pretty sure you had an amazing time getting to know other people. The event seemed pretty cool!